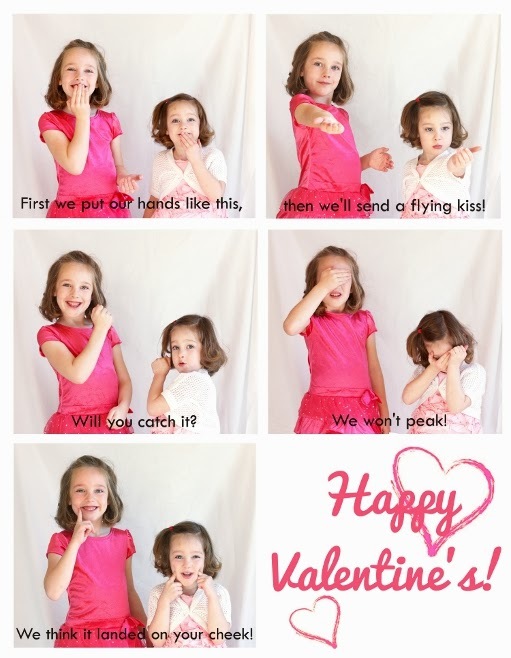 Most years Emily and I love to make a photo Valentine of my kids for grandparents and friends. Years ago, Emily helped me make these simple ones on a plain background that were fun--back when we lived close to each other. Then last year I made some that are a great way to remember not only how your child looked that year but also some of their cute quirks and favorites. Also a fun idea from Emily. Now this year I was inspired by a cute Valentine's card that my friend Sally made last year. Or not. That's why it is great to surround yourself with people who inspire you! Without further ado, here is this year's super cute Valentine's poem. This cute poem and actions were originally by Kerry Ardhya and it was printed in the February 2011 Highlights High Five magazine. Such cute girls!!! Darling expressions!